What is this?, you may wonder. Are these dumplings? No, silly, they’re pasta! 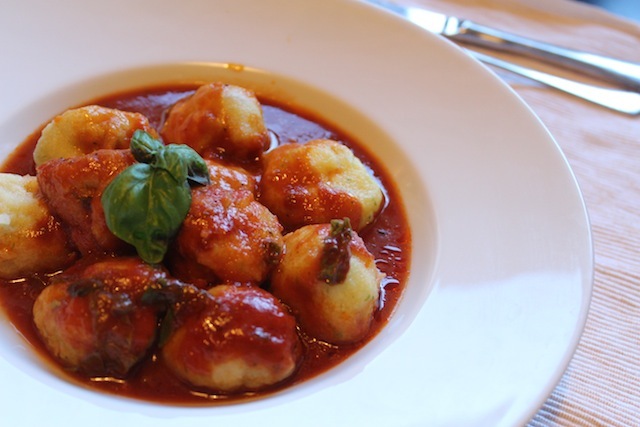 Durum wheat semolina balls – that is, pasta – filled with a crazy mix of carrots, mushrooms and walnuts, and topped with a light summery tomato sauce. Be warned: The recipe below is for 2 servings only. So if you’re a bigger group or very hungry, you may want to double it. 1. Well ahead of dinner time, prep your pasta dough. In a bowl, mix the durum wheat semolina with water and knead for about 10 minutes. It should have a moist and elastic texture in the end. Then, wrap your dough in a plastic sheet and place it in the fridge for about an hour. 2. In the meantime, prepare the filling. Heat up the olive oil in a pan on medium heat, adding the garlic; roast gently for about a minute. Then add carrots and mushrooms and sauté for another five to ten minutes or so. Throw in the walnuts and spices. Set aside. 3. In a small sauce pan, heat up the olive oil for the sauce. Again, add the garlic and roast gently for a minute, careful not to burn it. Add the tomato paste, and after 30 seconds the vegetable broth. Let simmer for as long as you like on low heat, and only add the basil in the end. 4. Once the dough is ready, roll it out on a lightly floured surface as thin as you can (mine ended up thicker than I would have liked). The wheat balls can be however big you like – mine were about 5×5 centimeters. Put 1/2 tsp. of the filling mixture in the middle and wrap it up nicely. Roll in your hands a few times before putting them in lightly boiling water (be careful or they might stick to the bottom of the pan). They’ll only take 3-4 minutes from here. 5. Get the wheat balls out of the water and add the sauce. Ta-da!